Gustavo Perez Arriaga, the man accused of shooting and killing Newman Police Corporal Ronil 'Ron' Singh was taken into custody Friday morning. BAKERSFIELD, Calif. -- Gustavo Perez Arriaga, the man accused of shooting and killing Newman Police Corporal Ronil 'Ron' Singh has been captured. The Stanislaus County Sheriff's Office says Arriaga was taken into custody, using Cpl. Singh's handcuffs, nearly 200 miles away in the Kern County town of Lamont early Friday morning. 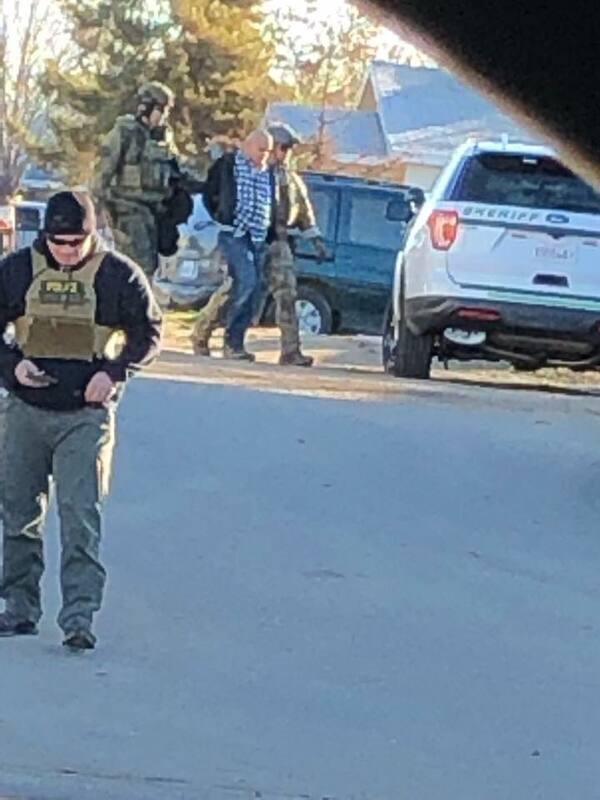 The Stanislaus County Sheriff's Department confirms to ABC News that this photo shows the capture of Gustavo Perez Arriaga in Lamont, Calif. on Dec. 28, 2018. Another brother of Arriaga, 34-year-old Conrado Virgen Mendoza from Chowchilla, and Arriaga's girlfriend, 30-year-old Ana Leyde Cervantes of Newman, were arrested on Friday for aiding Arriaga in evading authorities following the murder of Corporal Singh, Stanislaus County Sheriff's Department said on Friday night. Their booking photos were released, along with that of Arriaga. 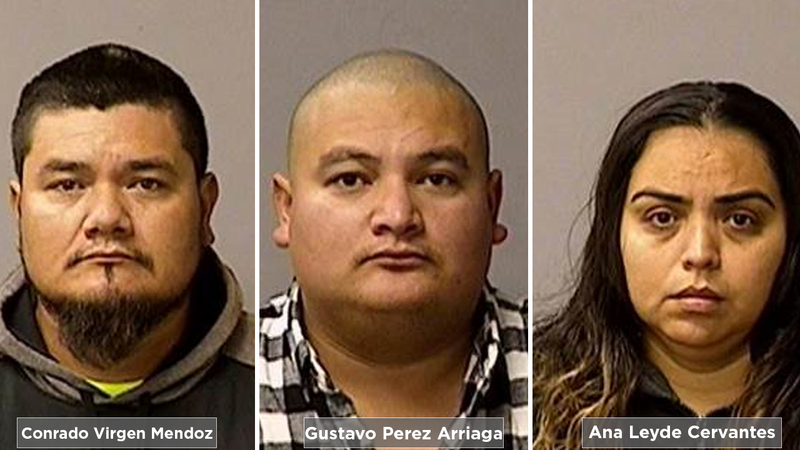 Kern County Sheriff Donny Youngblood said three additional people have also been arrested in the South Valley for aiding and abetting Arriaga. Stanislaus County Sheriff Adam Christianson says Arriaga was attempting to make his way to Mexico when he was arrested. He was found at a house in Lamont, California that was being monitored by law enforcement. According to Kern County Sheriff, when SWAT deputies surrounded that home, Arriaga surrendered without incident. Three additional people were arrested from the house for aiding and abetting, they include 59-year-old Bernabe Madrigal Castaneda, 36-year-old Erasmo Villegas and 57-year-old Maria Luisa Moreno. Sheriff Christianson says that Arriaga was a member of the Sureños street gang and had been arrested twice before on charges of driving under the influence of alcohol. The sheriff said that Arriaga crossed into Arizona from Mexico illegally a couple of years ago and it is believed that he had been working on farms in California's Central Valley. Arriaga is accused of killing Corporal Singh when he conducted a traffic stop on Arriaga's pickup truck in the small town of Newman early Wednesday morning, for suspicion of driving under the influence. As he pulled over the vehicle, Corporal Singh described it to dispatchers as a silver Dodge Ram with paper plates from AR Auto, a dealership in the city of Merced. Moments later, Singh called in for shots fired. Several deputies from both Stanislaus and Merced counties responded, where they found the truck and suspect gone and Corporal Singh lying on the ground. He was rushed to a nearby hospital but died from his injuries. That set off a statewide search for the suspect and his truck. Law enforcement quickly released surveillance video from a store showing the suspect. The truck was found outside the city of Newman in a mobile home park on Wednesday afternoon, but the suspect was not found in the area. On Thursday, President Donald Trump commented on the suspect's immigration status in a tweet, "There is right now a full scale manhunt going on in California for an illegal immigrant accused of shooting and killing a police officer during a traffic stop. Time to get tough on Border Security. Build the Wall!" There is right now a full scale manhunt going on in California for an illegal immigrant accused of shooting and killing a police officer during a traffic stop. Time to get tough on Border Security. Build the Wall! The victim, Corporal Ronil "Ron" Singh, was a K-9 officer with the Newman Police, a small department with just about a dozen sworn officers. Newman Police Chief Randy Richardson remembered Singh as an "American patriot" who came to the U.S. from Fiji to become a police officer and loved his wife and 5-month-old son dearly. At an emotional news conference on Thursday, Newman Police Chief Randy Richardson remembered Cpl. Ronil Singh as an "American patriot" who came to the U.S. to become a police officer and loved his wife and 5-month-old son dearly. The officer's canine partner, Sam, is now at home with the Singh family. Chief Richardson said that the dog would be retired from the department early to live permanently with the Singh family. The Stanislaus Sworn Deputies Association says please be aware there are NO other approved or authorized memorial fund or online fundraising accounts that will be established. Take a look at the latest stories, videos and updates on the shooting death of Corporal Ronil Singh.